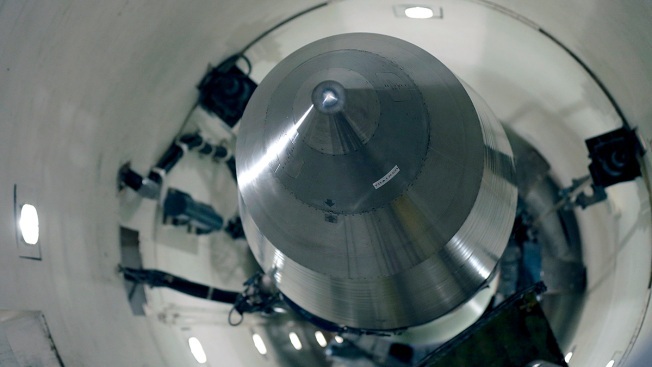 FILE - In this file photo taken June 25, 2014, an inert Minuteman 3 missile is seen in a training launch tube at Minot Air Force Base, N.D. Here's a question rarely raised before Donald Trump ran for the White House: If the president ordered a pre-emptive nuclear strike, could anyone stop him? Not the Congress. Not his secretary of defense. And by design, not the military officers who would be duty-bound to execute the order. As Bruce Blair, a former nuclear missile launch officer and expert on nuclear command and control, has put it, "The protocol for ordering the use of nuclear weapons endows every president with civilization-ending power." Trump, he wrote in a Washington Post column last summer, "has unchecked authority to order a preventive nuclear strike against any nation he wants with a single verbal direction to the Pentagon war room." Defense Secretary Jim Mattis on Sunday shot back at North Korea's latest nuclear provocation with a blunt threat, saying the U.S. will answer any North Korean threat with a "massive military response." These realities will converge Tuesday in a Senate hearing room where the Foreign Relations Committee — headed by one of Trump's strongest Republican critics, Sen. Bob Corker of Tennessee — will hear testimony from a former commander of the Pentagon's nuclear war fighting command and other witnesses. The topic: "Authority to order the use of nuclear weapons." Corker said numerous lawmakers have raised questions about legislative and presidential war-making authorities and the use of America's nuclear arsenal. "This discussion is long overdue," Corker said in announcing the hearing. Alex Wellerstein, a historian of science at the Stevens Institute of Technology who has researched and written extensively about presidential nuclear authority, said he hopes the discussion "might shed some more light on aspects of the procedures for presidential use of nuclear weapons that I think really needs to be known and talked about." 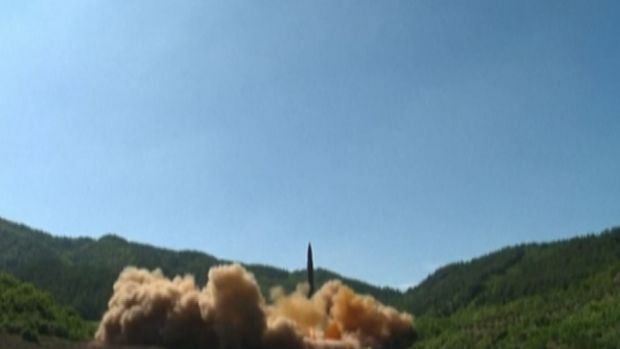 North Korea fired a ballistic missile from its capital Pyongyang that flew over Japan before plunging into the northern Pacific Ocean, officials said Tuesday. The aggressive test-flight over the territory of a close U.S. ally sends a clear message of defiance as Washington and Seoul conduct war games nearby. He said the U.S. system has evolved through tradition and precedent more than by laws. "The technology of the bomb itself does not compel this sort of arrangement," he wrote in an email exchange. "This is a product of circumstances. I think the circumstances under which the system was created, and the world we now live in, are sufficiently different that we could, and perhaps should, contemplate revision of the system." Asked about this Monday in an impromptu exchange at the Pentagon, Defense Secretary Jim Mattis was reluctant to describe his role in nuclear strike decision-making. "I'm the president's principal adviser on the use of force," he said. Asked whether he was comfortable with the system as it exists, he said, "I am," but did not elaborate. Nothing has changed overnight in the escalating situation with North Korea. That war of words between President Trump and Kim Jong Un is making a lot of people nervous. Although fielded and assigned for use by the military, the nuclear bomb is inherently a political weapon, given its almost unimaginable destructive capacity. That explains why the system for controlling the use of U.S. nuclear weapons has been designed to concentrate decision-making power in the ultimate political office: the presidency.